The book and themagazine version of TARZAN AND THE ANT MEN differ greatl. in text. The book deals at length with Tarzan's impersonator of TARZAN and the GOLDEN LION: Esteban Miranda, while the magazine story does not. Also in this book Tarzan was revealed to be a granfather- a fact which has not cropped up since. OUTLAW OF TORN was the second story ERB ever wrote altho it was the 3rd published. This was intended to be a serious novel and he spent 6 months in research work for it. It was a financial failure. The research for this novel was not altogether a loss, though, for he did use a lot of the material later in TARZAN, LORD OF THE JUNGLE. There may be some connection between the TARZAN COMIC STRIP: "TARZAN & THE MAYAN GODDESS" and "THE QUEST OF TARZAN" from the 1941 ARGOSY. "BEYOND THE FARTHEST STAR" was supposed to have been the first of a series, and is considered as a good piece of satire. Otis Adelbert Kline's novel "Buccaneers of Venus" did not appear in ARG-OSY because at the time he submitted it ERB submitted PIRATES OF VENUS. The story was similar in locale and title and even though they had al-ready printed 2 of the Kline's Venus novels, they turned it down because ERB was a greater drawing card. the Farley also had/same trouble. He wrote a couple of novels about the Ear-th' s Core and ARGOSY delayed them for years because of ERB's Pellucidar series. A LIST OF VARIOUS E.R.BURROUGHS COMICS, BIG LITTLE BOOKS, AND SIMILAR. Big-Little-Books pub listed by Saalfield Publishing Co. and Better-Little books published by Whitman Publishing Co. (going down the list then going to the second side) Tarzan of the Apes 1933 Tarzan of the screen 1934 Tarzan of the Fearless 1934 The Tarzan Twins 1934 New Adventures of Tarzan 1935 The Return of Tarzan 1936 Tarzan Escapes 1936 Beasts of Tarzan 1937 Tarzan with the Tarzan Twins in the Jungle (Fast Action Story) 1938 Tarzan's Revenge 1938 Tarzan the Avenger (Fast Act. 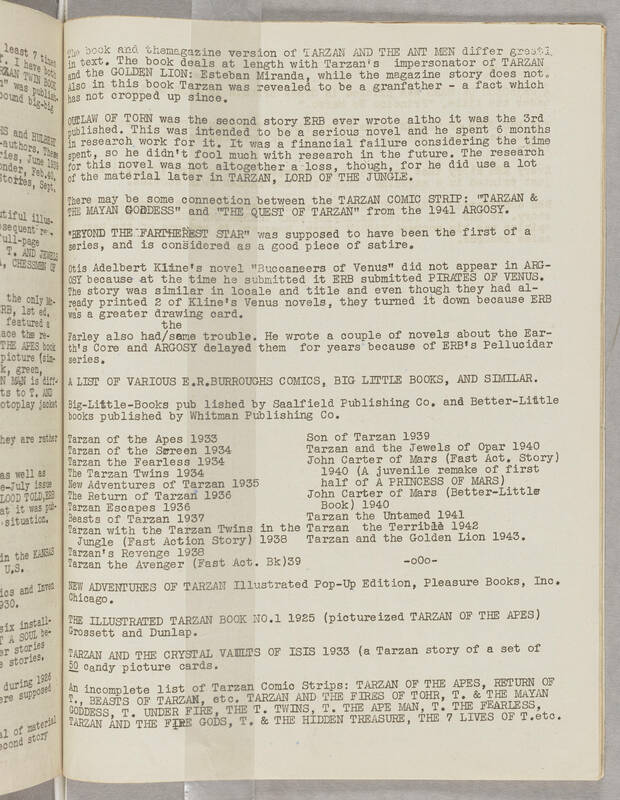 Bk)39 Son of Tarzan 1939 Tarzan and the Jewels of Opar 1940 John Carter of Mars (Fast Act. Story) 1940 (A juvenile remake of first half of A PRINCESS OF MARS) John Carter of Mars (Better- Little Book) 1940 Tarzan the Untamed 1941 Tarzan the Terrible 1942 Tarzan and the Golden Lion 1943 -oOo- NEW ADVENTURES OF TARZAN Illustrated Pop-Up Edition, Pleasure Books, Inc. Chicago. THE ILLUSTRATED TARZAN BOOK NO. 1 1925 (pictureized TARZAN OF THE APES) Grossett and Dunlap. TARZAN AND THE CRYSTAL VAULTS OF ISIS 1933 (a Tarzan story of a set of 50 candy picture cards. An incomplete list of Tarzan Comic Strips: TARZAN OF THE APES, RETURN OF T., BEASTS OF TARZAN, etc. TARZAN AND THE FIRES OF TOHR, T. & THE MAYAN GODDESS, T. UNDER FIRE, THE T. TWINS, T. THE APE MAN, T. THE FEARLESS, TARZAN AND THE FIRE GODS, T. & THE HIDDEN TREASURE, THE 7 LIVES OF T. etc.